Vampirism - Become a vampire! Since this is my first time posting here, might as well say how much I LOVE THIS MOD. Seriously this is exactly what I'd want from a vampirism mod. Ok, now for the thing that brought me here. My game crashed when I turned a Minecraft Comes Alive villager into a vampire due to Vampirism Addons turning his profession into an invalid value. "12 null" is what the crash report said. I'm guessing this isn't the same profession that vanilla vampire villagers have, as I've made those before in the same modpack (before adding MCA) and it was perfectly fine. I can send the crash report in a spoiler tag if that would also help. OreDictionary Info: Registered 736 names; 1460 stacks. Also just now I got a crash where it tried to set an MCA villager's profession to "13 null" as well, instead of 12 null. Thanks for the report. Sorry for the delay. I'm not yet sure what exactly is causing this issue. Vampirism does not mess with the profession id, but only passes the one MCA or Vanilla have assigned to the villager. So I am not sure how Vampirism is involved. As far as I can tell the specific crash occurred when a Zombie Pigman killed a MCA villager (normal or vampire or angry) and the game tried to convert the villager to a zombie villager. So I assume the game just randomly crashed. Is this correct or can you provide more information about what led to the crash? Edit: I was able to reproduce it by just summoning a normal MCA villager and a zombie. Once the zombie killed the MCA villager the game crashed, so I am pretty sure this is bug in MCA itself. Really? Could you have not used a proper guns mod? Oh wait, I forgot, there are none. All have fatal flaws somewhere. Yes, I AM a Vampire. Nice of you to notice. Why is that box so big? What do you mean I should stop breaking the fourth wall? Can you add the Vampire Killer morning star whip from Castlevania as well as the sub weapons? I have some suggestions for this mod! Add an umbrella that you can craft with some sticks and black wool (or any wool) but you must carry it in your items all the time or you'll burn. Make it so that when vampire hunters are low on health, your bites that does damage takes some blood too. Make it so that you can also drink blood from other vampires if theyre low. Skill that makes things turn into vampires and you can turn them into your minions. 1. Add an umbrella that you can craft with some sticks and black wool (or any wool) but you must carry it in your items all the time or you'll burn. 3. Make it so that when vampire hunters are low on health, your bites that does damage takes some blood too. 4. Make it so that you can also drink blood from other vampires if theyre low. 5. Skill that makes things turn into vampires and you can turn them into your minions. Hey, thanks for the suggestions. There's always been a bit of a minor conflict between Vampirism and Lycanites mobs mods. Nothing of the game crashing sort of issues, but a conflict of functions none the less. As the way Vampirism handles changing the player to a Vampire Hunter or a Vampire causes a change to the player's UUID (if i'm recalling it correctly) which in turn breaks the AI of all tamed Lycanite mobs for the player in question after having said changes occur - due to the changing of the player's UUID, The tamed mobs no longer recognize their master and stop functioning as intended. But now that you've created your Vampirism Integrations mod, i was wondering if you could include some support features in the Vampirism Integrations mod to remedy this issue. As forcing the player back to their original UUID might restore functionality to the tamed mobs, but fully removes all abilities and faction settings from vampirism - atleast from what i recall from testing myself long before the integration mod was created - as i did in fact contact Lycanite himself to try and solve the issue on his mod's end first when i had originally thought it a bug occurring with Lycanites mobs. If its impossible to find a fix for this conflict due to minecraft limitations then i fully understand. some mods are just not meant to play nice together, its a fact of modding. That being said though, at the time back when i had originally asked lycanite, he himself didn't know how to correct that issue because he didn't have enough knowledge behind the coding of your vampirism mod to create a fix for the conflict himself, something i know for fact you do have knowledge of Maxanier. --- Which gives me at least a bit of reassurance that you might be able to create a fix for the mod conflict within the vampirism integration mod itself - separate from the main mod. Here's the old LycanitesMobs github and its new location LycanitesMobs gitlab if necessary for this request. I think he/she meant update Vampirism Integrations for the Howling Moon mod. I support that, since I was playing with both Vampirism and Howling Moon and I saw a vampire next to a werewolf hunter, in a vampire forest, which looked very weird. As seen on the Vampirism Integrations mod's page. Any chance, Maxanier, that you could look into compatibility with Biome Bundle? It does wonders for Minecraft world gen, and seems to kill vampire forests- probably b/c it uses a different world generator? I have created an Github issue for that. I haven't observed the player changing uuids, but I will double check that. As that mod does not directly support third party biomes, the only way is to manually add it to the biome bundle. As a vampire, can we transform into a vampire lord form or something similar or has that not been implemented yet? Good to see development alive and well. Great work. I am having a serious issue though - a really weird one. Vampire hunters are viciously murdering my Ancient Warfare 2 NPC workers! Poor innocent farmers. Why?!? These are completely defenseless hard working peasants. I need them for resources to build walls and armies to defend the close pair of villages I adopted. 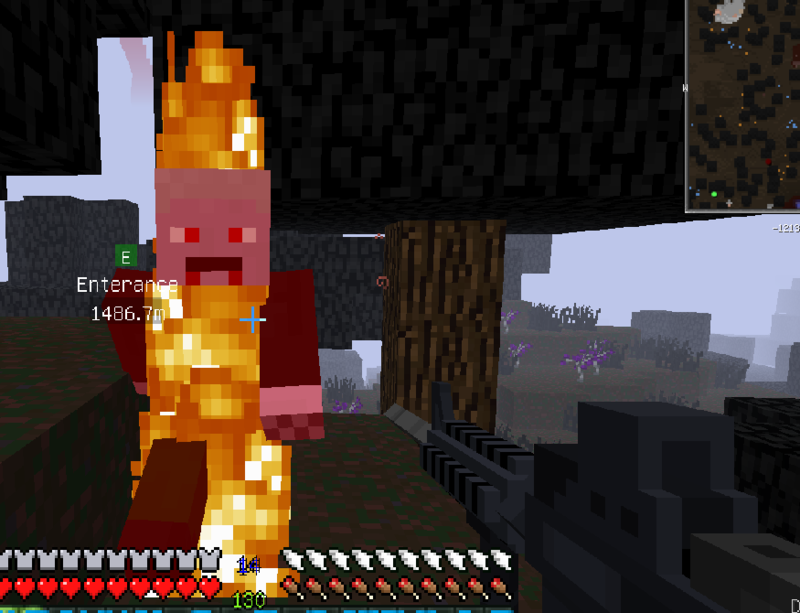 I killed one hunter while trying to defend Herald, one of my farmers, and several more hunters instantly spawned and killed Herald (who did nothing to fight back but run) Also a poor villager was injured in the crossfire. This is bad and a bit unworkable. I could understand vampires attacking my human NPCs but the hunters attacking is just wrong on so many levels. I dug pits and buried the hunters alive for the moment but is there a fix for this so I can let them out on parole? I fear more are still going to spawn due to the presence of the workers they don't like . How do you dispose of an excess of hunters? Killing them seems to make them multiply (I could be wrong). Is there any way to relocate them? Does killing hunters affect my standing with the villagers in any way? Is there any config fix? Integration between Ancient Warfare 2 and Vampirism could have so many possibilities. If I became a vampire I would much prefer to eat the ancient warfare hostile human factions who have ganged up in masse to maul me rather than attack peaceful adorable MCA villagers. There are tons of human mobs in AW2. The Minecolonies mod also has hostile human barbarians. At least the bullies should bite-able! AncientWarfare2 makes the hunter attack their NPCs (because the hunter attack (some) players). Vampirism is actually innocent here. Hunter do slowly respawn if you kill them or hurt to many villagers. However, if you somehow imprison them inside the village area, no new ones should spawn. "Hunter do slowly respawn if you kill them"